Dolph Lundgren received a Fulbright scholarship to MIT and holds a master’s degree in chemical engineering. Sylvester Stallone received money for making eleventy billion sequels and holds Donald Trump in high regard as a “Dickensian character.” The fact that Creed II was co-written by the latter may help explain why it feels like little more than a shockingly violent episode of This Is Us, Milo Ventimiglia included! Writer/director Ryan Coogler’s Creed was an emotionally dense, slyly savvy fight flick with bold and original cinematography from Maryse Alberti. Its sequel from director Steven Caple Jr is a cinematic Benedict Arnold, a savage traitor to the morals and themes espoused by the original, saved from toxic oblivion only by the charisma of a few performers and generically entertaining fight choreography. After becoming the champ in a spectacularly uneventful early sequence, Adonis is publicly challenged by Viktor, who appears to literally decapitate every opponent he faces. Despite his recent engagement to Bianca (Tessa Thompson), who is pregnant with his child, Adonis accepts the invitation for facial disfigurement despite the fact that this decision flies in the face of every consequential moment from the first film. What follows is a painfully predictable back-and-forth quest by Adonis against an adversary who should be a wounded kindred soul but who is instead a cartoon Boris used to make this all about stale themes lingering from the Rocky franchise. The description of the first Creed as “black Rocky” is clunky and simplistic but not without meaningful positive association. Welded on to a crowd-pleasing, underdog-rising framework were nuanced reflections on family, identity, social expectations and relationships authentically inherent to black characters. 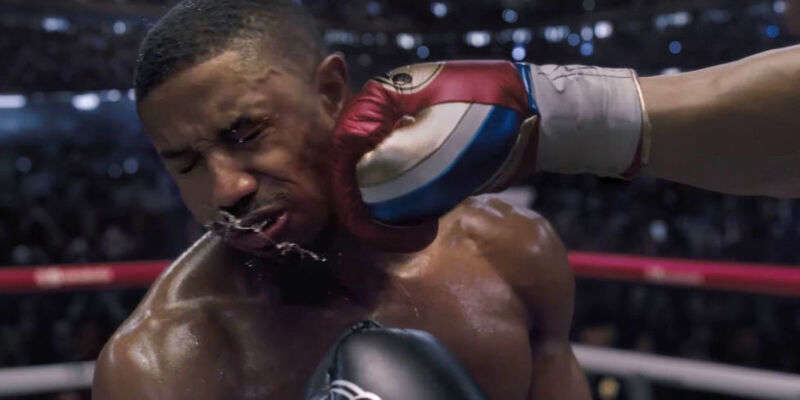 Creed II not only fails to revisit or extend those explorations, it outright violates them. Adonis repeating the callous sins of his father at the precise moment his own child is born is presented as a good thing. Bianca, who was a vibrant character with her own arc last time is reduced to ringside cheering for her man. A storyline involving a medical condition that will strip her career from her is forgotten faster than the existence of Rocky V.
Watching Jordan and Thompson clawing and biting their way through the wretched melodrama they are bound and gagged by is as frustrating as imagining what Creed II could have been in the hands of Coogler and his team. They could have even kept the dorky, lame “Creed’s son fights Drago’s son” premise in exploration of Adonis asking how to define himself after having burned through the rage of abandonment. Creed III, which is inevitable given box office returns, can pit Adonis against Mr. T’s son if it wants to, provided it ditches Stallone from the writer’s room and lets this franchise become something more than uninspired Rocky remains.